This article is a review of Blis-Sox Blister Prevention Socks a product that is designed to help prevent blisters while walking. They can also provide comfort to already blistered heels. If, like me, you dread taking your boots off after a long walk and seeing blisters around your ankles and heels this product may make your life more comfortable, by preventing or reducing those nasty blisters. Recently my lovely comfortable trusty hiking boots were coming to the end of their life they were just worn out, I now had the prospect of breaking in a new pair of hiking boots. To begin with, I just undertook short walks with the new boots on to break them in. In the end, though I had to use them on a 4 mile hike. The blisters I received were not a pleasant sight!! It took best part of a week for me to recover from them. So I decided to look at and research products that would help to prevent or reduce blisters while walking. Something I needed until the new boots were completely broken in. While researching I came across a product called Blis-Sox’s and decided to give these a try out, I was certainly pleased with the results. These are simple to use. Just put them on as you would a normal pair of socks and adjust to get a snug fit. Then put another pair of socks that are not too thick over the top. Then you are ready to put your hiking boots on. Do this gently so you don’t move the protective gel pad away from the heel. When you first look at these socks the obvious difference from normal socks are the lack of toes. The sock instead sits around the back of the heel and is held in place just behind the ball of your feet, by breathable, seamless and vented fabric. The back of the sock, that covers the heel area, contains a gel that is there to protect you from getting blisters. This gel also contains ceramides, aloe vera and shea butter to help keep your skin hydrated. Over the Blis-Sox I wear a thin pair of socks just ordinary mens socks. I wear them inside out so the seam by the toes does not irritate and cause rubbing or blisters. This way I managed to walk approximately 4 miles without getting blisters in my new hiking boots. I did, however, get a small amount of rubbing on my right foot heel which I feel was acceptable and a considerable improvement compared to the damage I received when hiking without wearing the Blis-Sox. This product is easy to keep clean, just wash in a little soapy water, then rinse well and air dry. If you read any information on how to prevent blisters when hiking the advice is to use double layered socks. These are just like ordinary walkers socks except the “foot” part is made up of two layers. The idea is that the two layers help to prevent friction between your skin and the hiking boot. I have tried these in the past and I have never been able to get on with them, I just find them too thick, hot to wear and uncomfortable, but I know many regular walkers that swear by them. You can also buy special plasters that protect against blisters, or you can place these over an existing blister. They can be good but they have a habit of coming unstuck when you do a lot of walking. I also find that if you have to use these plasters regularly the cost soon mounts up. If you suffer regularly from blisters while walking I would wholeheartedly recommend this produce. The socks slip on and gently wrap around the back of the heel and are thin enough so you don’t even know you are wearing them once you start walking. 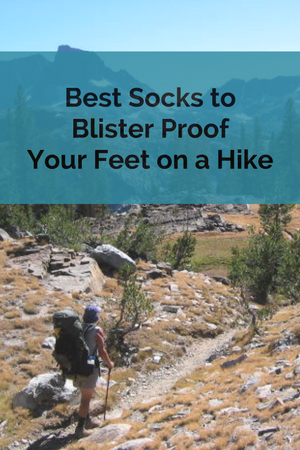 These socks will help prevent nasty blisters forming, and soothe existing blisters, and can make a long walk a pleasant experience instead of a painful and uncomfortable one.